Take a trip with Spelvin to a land of lights and glitter! It is your host with the most, entertaining you like a true music superstar ! Spelvin Game Take a trip with Spelvin to a land of lights and glitter! Play it like a gambler as you scramble for words and gamble with Juice! Spelvin is your host with the most, entertaining you like a true music superstar. 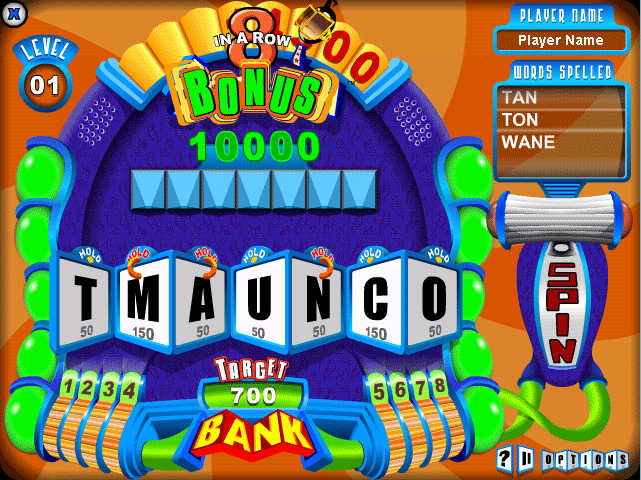 Come feast on audio and visual treats as you enjoy this stunning, over the top spelling game. You wanna be a Rock Star, or just spell like one? "It was fast paced and made you think! I found it quite enjoyable. I loved the whole game concept!" "Yet another thumbs up from a video game collector...although I don't really like word games, I do like this one because it has "class". "The layout was brilliant, the difficulty good, but controllable. One of the BEST word games I have seen to date"
"THIS GAME WAS GREAT TO PLAY, works great, sounds better, and offered a challenge.... Kept me thinking the whole time. It was just a completely enjoyable game. If you think you know words try this game..."
"YOU have got to try this! It's Awesome!"